Union Square Holiday Market. This holiday market is central to many subway stops and is great for browsing. You can meet up to explore and if things go well, head to the local movie theater or many restaurants nearby. If things don’t go well, then say you remembered you need to be somewhere. Walk a street fair. 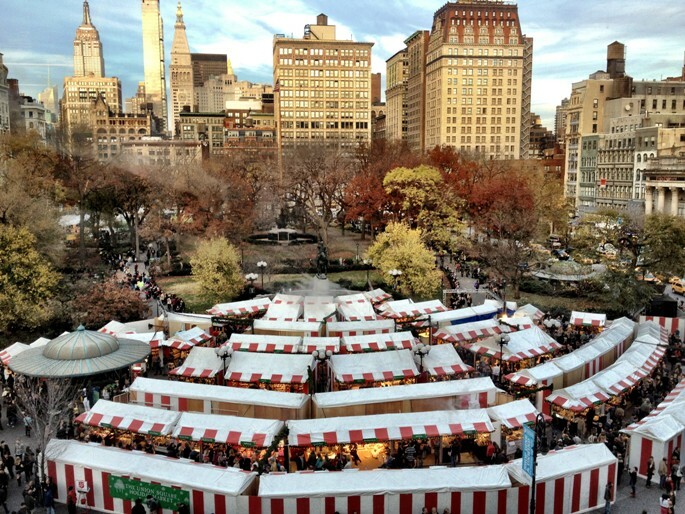 There are so many fairs and events going on at any time in Manhattan. These are a great opportunity to wander and learn more about his tastes. You can sample different foods and if you hit it off, dazzle your taste buds with a sit down meal. Chinatown Ice Cream Factory. A really fun place to visit and who doesn’t love ice cream?! There’s not much seating so you can cozy up in the park nearby or scoff down your ice cream and meet a friend for great SoHo shopping to get over your bad date. Coffee shop. I know Amy yells at me for meeting up on such a casual date (editor’s note – I just want the best for you dahling, xo MG!) but I think grabbing something quick with someone is a ‘no pressure’ situation, so if anything is off you can make an excuse to leave. Or, hopefully, if things go well, then you can sit there for hours and have a great conversation. A friend recommended Ceci Cela for a fabulous chocolate croissant. If things go well then you can always go grab a real meal or explore the city together. With dating sites like HowAboutWe and apps like Tinder encouraging more casual meet ups, I still think it’s good to test the waters with a date before having a romantic (read: expensive) date. What are your thoughts? Do you keep it casual on your first meeting with an online match?